Himuti is gone. We said a sad goodbye on April 4, 2016. We knew the day was coming. He’d already outlived expectations following a cancer diagnosis nearly 16 months earlier. With few exceptions, he lived his last months with wolfish vitality. Himuti’s name in the Hopi language means “proud of oneself,” but he wasn’t arrogant. Rather he was born with a mighty and agreeable self-confidence. While he never fathered pups, and was not released to the wild, his casual confidence allowed him to make a huge contribution to the survival of his species. He was an instructor. He taught us about wolves. Over the 8 years Himuti lived at Southwest Wildlife, hundreds and hundreds of people saw an endangered Mexican wolf for the first time. His curiosity often brought him up to observe people. And many of those people connected with this special wolf. Himuti’s presence made a wolf into a living, breathing, handsome individual – not the frightening animal from childhood fairy tales. We shared wolf biology, while people observed his grace, coloring, size, and were drawn in by his eyes. Through Himuti, people learned of the tragic demise of wolves in our country, the challenges of recovering a nearly extinct species, and the controversial reintroduction of a large predator into a landscape altered by humans. 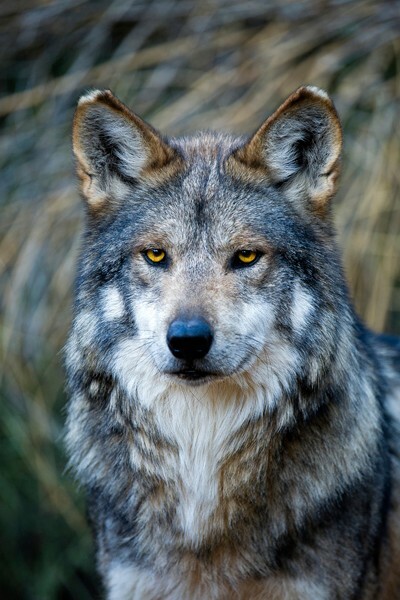 People listened to the history of his Mexican wolf family and were moved by the epic love story of his parents. If, as Nelson Mandela said, “ultimately conservation is about people,” then Himuti’s connection with people linked them to his species in a powerful way. He moved people to learn and to think about wolves. He moved them to share his story and to stand up and speak out for their conservation. That’s a remarkable legacy for one wolf. Thank you Himuti. It was such a privilege to be your student. sperm allows the potential continued genetic contribution from that wolf after its natural death. Southwest Wildlife participated in this program and, while in our care, Himuti contributed to the bank. So, it's possible that one day he will father puppies and we will see those beautiful golden eyes in future generations of Mexican gray wolves. Himuti's self-assurance was nurtured by his parents’ close bond. His mother was Tanamara (F547) and his father Picaron (M520). Theirs was a genuine love story. See photos of Himuti's family and read PJ Harrison's memories of watching his pack grow up at the Endangered Wolf Center. 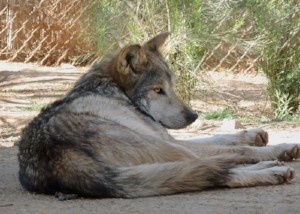 Thank you for helping us to celebrate Himuti's life and working to preserve the Mexican gray wolf.